If you’re looking for a bike-friendly beach vacation, Anna Maria Island is for you. 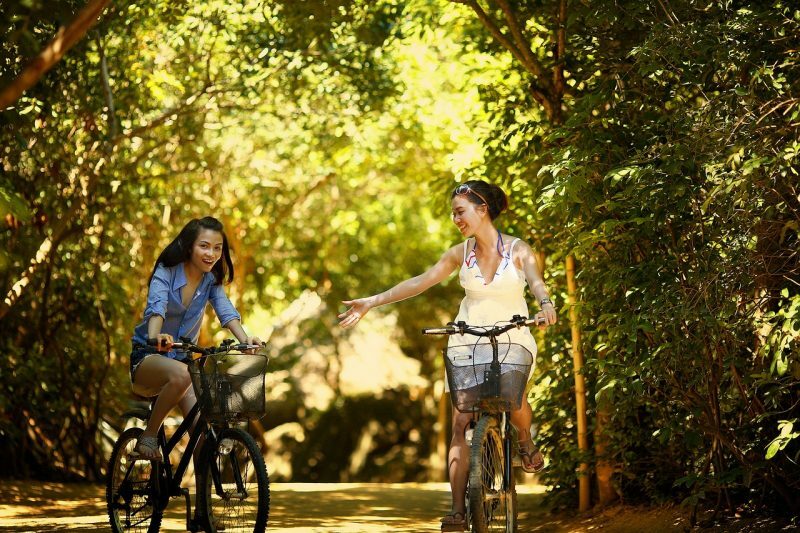 This island is perfect for couples and families who like to keep their transportation “green” by using bike paths instead of motorized vehicles. Stop off at one of the many Anna Maria Island bike rentals shops, and cruise around the island, stopping at your favorite beaches, restaurants, and attractions along the way. Walking and cycling are the norm for transportation around the island, which is only about two miles long and seven miles wide. The beach is a stone’s throw away from pretty well anywhere, and many Anna Maria Island vacation rentals are located right along the waterfront. With lots of lights, stops, and pedestrian crossings, speed limits between 15 and 25 miles per hour, and heavy traffic depending on the season, biking can be just as fast – if not faster – than getting around by car. Fortunately, Anna Maria Island is set up for cyclists, with bike trails, paths, and lanes throughout the island. Ride up and down Gulf Drive, the main north-south street that runs the length of the island, using its wide bike paths. Many of the attractions, beaches, and restaurants on the island have free bike racks in order to lock up your ride while exploring the island. If you’re looking to explore the opposite end of the island by bike but aren’t up to the seven-mile ride, hop on the free island trolley that runs all day long. Each trolley can hold two bikes. Check out the City of Anna Maria’s online “Bike Route Guide” for more information on official bike routes on the island. Nearby Longboat Key and Lido Key also both offer bike paths with beautiful views, if you’re up for a longer ride. Or, alternatively, head across the southern bridge to the mainland village of Cortez for some dockside, Gulf-to-table fish and seafood. For additional safety, don’t forget the “ABC” bike check: air in your tires, brakes working properly, and a chain that’s taught, clean, and oiled. Anna Maria Island has a variety of rental shops that offer everything from bikes to kayaks to beach equipment. Check out AMI Adventure Rentals with so many adventure excursion options in additional to bike rentals. On the north end of the island, try Beach Bums Rentals & Gift Shop (427 Pine Ave.) or Island Scouter Rentals (9908 Gulf Dr.). These shops are located within a few blocks from each other, and offer beach cruisers, tandem bikes, geared bikes, and even tricycles. Prices range from $5 an hour to $100 a month, depending on the size and type of bike. Midway down the island, you’ll find even more Anna Maria Island bike rentals. Try Fun and More Rentals (5347 Gulf Dr.) or Island Scooter Store (5321 Gulf Dr.), both in Holmes Beach. At the southern end of Anna Maria Island, check out AMI Beach Fun Rentals (3228 E. Bay Dr.) for all your vacation gear. Many of these shops also rent motorized scooters, golf carts, and paddlecrafts, as well as beach equipment like umbrellas, lounge chairs, baby gear, and water toys.